Jaipur : A packed Rajnigandha Silver Pearls Front Lawn of 5,000 people welcomed Gulzar with huge cheers and applause this morning as he spoke of nostalgia and mesmerised his audience with a recital of his poetics gems. In a session over at the Char Bagh, historian Vazira Zamindar said that the Partition represented ‘the deep, dark side of modernity’. According to Ayesha Jalal, the challenge for a historian is to show how debates and discussions transfer into the post-independence period. Narratives are required for people to pick up and piece together information, historian Yasmin Khan suggested, otherwise run the risk of making the same mistakes again and again. Jalal shared an interesting fact here, ‘39% of Pakistanis say that they were helped by a Hindu or a Sikh during the Partition’ and said that these narratives haven’t been told yet. 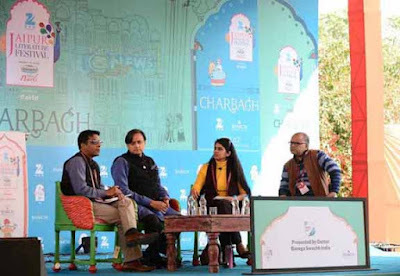 Bestselling writer and naturalist, Helen Macdonald talked with publisher, Chiki Sarkar about her metaphoric flight with her goshawk at the Google Mughal Tent on the fourth day of the ZEE Jaipur Literature Festival. ‘The thing about wild creatures is that they are clearly not like us’. Most nature books show people going to the wilderness and returning healed but Macdonald brings the wild with her in her house. H is for Hawk is an memoir of loss but before that it is a book that takes you on a flying lesson to view your grief from a ‘bird’s eye view’. In 2014, Prime Minister Narendra Modi announced an ambitious civic project ‘Swachh Bharat’ (Clean India). So what does it take to clean India? Shashi Tharoor, Desraj Kali, Anustup Nayak and Sanchaita Gajapati Raju looked at the causes and possible solutions. Shashi Tharoor called for an attitudinal change. He said that a majority of people in India don’t own responsibility for their surroundings. Anustup Nayak, Vice President at XSEED Education highlighted that the future of a clean India lies in the hands of young children. The panellists agreed there’s no ‘silver bullet’ to make the change overnight, it is a combination of education, responsibility, infrastructure and resources that needs to be streamlined to make India a cleaner nation. Carrying on its celebration commemorating 400 years of Shakespeare’s literary genius, the ZEE Jaipur Literature Festival, now in its ninth edition, hosted American professor of Shakespearean Literature James S. Shapiro as he discussed the influence of the Bard of Avon on art, culture and society in America.Citing his anthology Shakespeare in America, Shapiro threw light on the role of the playwright’s works as a prism through which crucial American issues such as slavery, revolution, war, and social justice, were refracted and understood. The session ended on the endearing note of a ten-year-old boy asking Shapiro about how and with which work of Shakespeare he should get started with reading the great playwright. Admitting to his late start and initial ‘defeat’ in comprehending Shakespearean English, Shapiro insightfully suggested the boy to perform scenes from plays like Romeo and Juliet and Julius Caesar with a group of friends, rather than simply reading them, adding that that’s the way they were meant to be understood.